April 1. Cast off, and I'm not talking knitting. April Fool's Day seems such an appropriate day to start any new undertaking. It's always wonderful to be setting sail alone, even when you've never done it before. The boat doesn't seem too difficult to handle, or won't be when I get the hang of the sail thingys. It was very nice of my friend and therapist Heather to loan it to me, if rather unintentionally. Well she told me I needed to take some time out, and I took her at her word. April 2. Setting course 270 degees north by 135 degrees east! 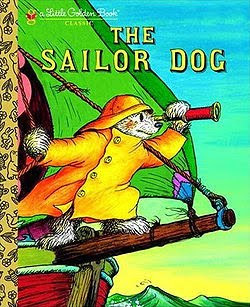 I was never good with numbers, or directions, but it sounds very Scuppers the Sailor Dog, my favourite book from childhood. I have it with me in case of emergency. Be prepared. April 4. Lost a day yesterday. Don't know quite what happened there but I suppose that's the way it goes with ships' logs and a formerly well stocked grog cabinet. April 5. A great discovery! The boat has an engine. It also has a simple on-off switch which I am able to operate. This is just as well as it would seem there was a bit of wind last night and the sails look ripped and torn as a punk's laundry. Fortunately I slept through it all, having finalised my audit of the grog. April 6. Of course, what I really want to do is write, and thought some time alone in a distant place might help me get down to it. I have been intending to write the great post-Conradian novel of the sea all my life, but hindered by distance from it. Fortunately with Global Warming the sea is coming within easier reach of all and thus my ambition is to be fulfilled. April 7. Started my novel last night, titled The Pull of the Pulley. That's fine, I told myself, it's only a working title and everyone has to put up with those. But after writing a couple of pages I decided novels are pretty hard things and so decided to make this log my book. With any luck I'll disappear on my epic journey and the log will be found and published and become an international bestseller and I'll be found later happily living on a tropical island with my beautiful bride and our kids and we'll all live happily after on the generous royalties from the publishers. Well I did say with any luck. April 8. Sat up all last night and today reading Conrad. I had never read him before, though my po-mo writing tutor appropriated some striking passages for a story he published, if arguably without complete acknowledgement (he said that's fine in a po-mo kind of mode). I got through Heart of Darkness, The Shadow Line, Typhoon and The Bleep of the Narcissus. I found the last one a bit of a worry though as there is a fantastic storm sequence in it which made me wonder whether I might encounter a typhoon, hurricane or such myself out here at sea. If that's where I am, and not a bay, strait or ocean. It's very confusing with all this water about, and it all looks surprisingly much the same. April 9. Am really enjoying the solitude. Just me and the boat and the sun and waves. Quite a lot of waves actually, and I saw a dolphin. Well, either that or a fifteen ton great white shark. April 10. Saw more waves today. And another dolphin, I think. April 11. More waves. Very pretty. May 4. Lost a couple of days there, I think. Still enjoying the solitude, though possibly going slightly mad and miss company. May 9. Had a waking dream that I was with friends drinking in the uni bar. Remembered the title of that Chatwin book, What Am I Doing Here? (Idea: maybe I could appropriate the title and write this log as that. Surely that would bring me money and celebrity, even if by theft and subterfuge. We all have to eat don't we? Besides, the one thing I remember my tutor saying in class, and which he stressed we had to remember at all times, was that titles are not copyright.). May 25. Just realised I hadn't eaten properly or bathed since I started looking at the damn waves. Also it would appear the dolphin wasn't a dophin but a shark after all, one that has taken a great white bite out of the boat, which is slowly sinking. Poses something of a conundrum as I haven't seen a skerrick of land since I left. June 2. Some young Thai blokes came on board today. They told me they were pirates but I laughed saying you have to be joking as none of you has a peg-leg or a parrot and besides real pirates don't wear Gap. They didn't seem to have a terrific of humour though, and wanted anything valuable I had on board, which I said was my CD collection of vintage New Wave. They took my boxes of canned food and computer and tied me up and left a Clash song playing on my old walkman they didn't even bother to steal. Now I'm really lost in the supermarket. Lucky though I'd been writing this log by, of all things, hand! June 10. Saved! I have been intercepted by the HMAS Hanson. It's the latest thing in Border Security Policy, with zodiac loads of grain-fed young blokes in black seal-like outfits, guns and battle helmets. June 15. Despite the fact that I had a valid Australian passport and current NSW driver's licence they took me to Christmas Island Detention Centre for "processing" (which sounds creepily a bit like turning me into hamburger mince - one can only hope not!). It's all probably to do with those three demerit points I got for doing a U-turn on Bondi Road last year. Anyway, with luck I'll be home by Christmas. Unless there's a change of government, in which case I'd better learn Arabic and Sinhalese and settle in for the long haul. Still, with any luck there'll be a book in it. Well I did say with any luck. The day he defeated Malcolm Turnbull for the Federal Liberal leadership at the end of last year, Tony Abbott came out strongly for a debate on nuclear power for Australia. In the following days he backslid, admitting it would be a long way off - and too far in the future to be part of any immediate response to human-caused global warming (not that he believes in it anyway). 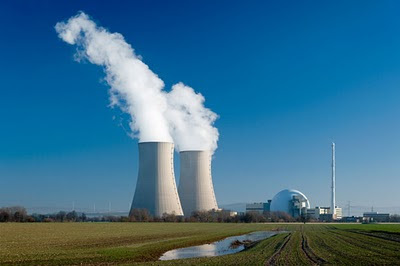 Besides the time lag to get nuclear power stations into service - usually estimated at around two decades - the other difficulty for the Nuclear Liberals is that Australians don’t want them, and certainly nowhere near where they live. Recently there have been numerous articles in the press putting the nuclear case, as part of an obvious attempt to get the nuclear push going again, as it was in the dying days of the Howard government. Notable among these was a piece late last year (The Australian, 18 December 2009) by Ziggy Switkowski, the former Telstra boss who chaired the Howard Government’s review of uranium mining, processing and nuclear power in 2006. Titled “A clean and green way to fuel the nation”, Dr Switkowski’s piece addresses a range of concerns of Australians about nuclear power. He does not tell us how toxic that family car of waste is, and what risks it would pose to people if they ever came into contact with it. Nor does he mention that radioactive materials in this waste take an extremely long time to break down, and would remain very toxic for literally thousands of years. Here we have the price for nuclear power - turning an area of central Australia into a “deep hole in the ground” for highly toxic waste. Northern Territory lands are already under threat from Rudd Government plans to bury tonnes of radioactive waste accumulated over decades - but that would be nothing compared to the waste that would accrue from a commercial nuclear power programme. One can only wonder how most people in indigenous communities would feel about yet another dose of radioactivity, another Maralinga on their tribal lands, courtesy white Australia. And what would Dr Switkowski have to say if and when toxic waste escapes and poisons the land and mutates generations of Aboriginal children? That’s right: Sorry. 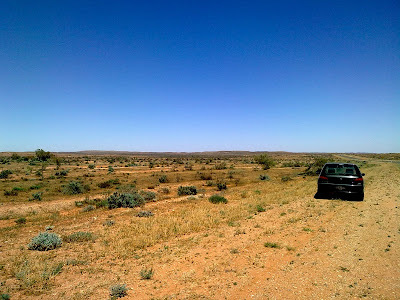 Central Australia is not a blank, there for the grabbing and polluting. It is a part of our continent, precious to us all, but especially so to the peoples who have lived there for tens of thousands of years. If there is nothing whatever to fear from nuclear waste, perhaps Dr Switkowski should drill his big hole where the nuclear shareholders will be, in Paddington, or Toorak. Those living there need have nothing to fear, as the hole will be very well engineered, to world’s best practice. A major omission in Dr Switkowski’s comments concerns what effects over thousands of years that leaking and leeching radioactive waste might have upon Australia’s precious subterranean aquifers. For a nation as reliant as we are on underground water, that represents a massive gamble to say the very least. Where would they be then, on our beautiful coast? Manly? Byron Bay? Portsea? No, they would go where industry has already left its mark - Port Kembla and Geelong, for instance. One can only imagine how the communities of Wollongong and Geelong would greet the nuclear spruikers coming to town with their Homer Simpson job offers: “Get a life - and a half-life too!”. But Dr Switkowski is determined to meet community concerns about reactor placement head-on. “’Reactors in your back yard’ is an easy scare campaign but it's silly and insults the community's intelligence,” he said. It’s also easy to dismiss legitimate concerns of communities with high-handed, patronising comments. As a wealthy former CEO, he is unlikely ever to have to have to expose himself and loved ones to the risk of living near a nuclear power plant. Communities have every right to weigh the costs and benefits, and potential risks to their families, of any planned development in their area, be it residential or industrial, a prison, a nuclear dump, or a nuclear power plant. If Dr Switkowski has clear ideas of where such plants would go, as he seems to, let him publish them now. After all, if he thinks “scare campaigns” are merely silly, then he should be confident his profound common sense will prevail. His difficulty here is that a single “penetration” would be enough to cause truly catastrophic consequences. Nuclear power stations would be prime terrorist targets, and with Australia having been a frontline participant in the Iraq and Afghanistan wars, as recent terror cases have shown there are zealot nuts aplenty who wouldn’t blink about killing us in their pursuit of their own lofty goals or lack thereof. It’s one thing to shoot people or blow up a bridge, but another entirely to fly a light plane packed with explosives just a little way off course, and into a nuclear reactor. Does he propose to equip nuclear plants with anti-aircraft batteries, or to have the RAAF patrolling all of them 24 hours a day? We must remember too that the even the US Air Force failed to scramble fighters quickly enough against the September 11 hijackers to intercept them. So much for the security systems he expects “never to be stressed”. For “support”, read “subsidy”. In other words, the taxpayer will have to foot at least part of the bill for this enormously expensive scheme which would place nuclear reactors up and down our coastline, sites which would become prime and very dangerous terrorist targets, and which would generate waste which would remain highly toxic for thousands of years, and which we would dump in a big hole in the ground on or near tribal Aboriginal lands, and pollute the last water we could rely upon in the droughts to come. And that is not to mention the danger of increased nuclear proliferation. Part Two of this article will be posted next week, examining the solar alternative to nuclear. There is an old joke that if you a play a Country & Western song backwards you get your dog back, your pickup back and your girl back. The conventional wisdom regarding popular love songs is that they are all either boy meets girl, boy loses girl, or boy gets girl back again. As we drove up the Silver City Highway listening to vintage pop on the car CD, the succession of three songs prompted questions. The songs were the Sixties classic “1-2-3” by Len Barry, Bryan Ferry’s lounge makeover of the jazz standard “These Foolish Things”, and the Beach Boys’ “Break Away”. As my son and I sang along, I was thinking well, yes, “1-2-3” is a classic boy meets girl song: One and one are two/ I know you love me and oh-oh/ How I love you. Then there was Bryan Ferry crooning the opening lines of nostalgia for lost love: Oh will you never let me be?/ Oh will you never set me free?, remembering all the tiny details of the time with the departed lover, down to Gardenia perfume lingering on a pillow/ Wild strawberries only seven francs a kilo. Those two were definitely boy meets girl, and boy loses girl. But then came “Break Away”. The Beach Boys are probably contested territory these days. 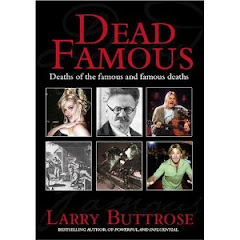 They were too white bread ever to appeal to a pomo gen - although that of course does not rule out a fanatical sub-culture I have not heard of - but they did re-make popular music in the Sixties to an extent that they commanded the respect of the Beatles. They wrote infectious pop, they sang harmonies of wonder, like the Beatles they continually innovated and progressed, and unlike many acts now their innovations went far deeper than image make-overs. More than anything else, they spoke of the good life in postwar California. There was sun, surf and fast cars, and there was plenty of love to made with the Californian Girls. Early songs like “Surfin’ USA” and “Fun Fun Fun” developed into the more complex choral orchestral “Good Vibrations”, but as the Sixties ended, so did the run of Beach Boys hits. There was one more though, “Break Away”, in 1970, and although it had their trademark sound and harmonies, it was very different in temper. It begins: Time will not wait for me/ Time is my destiny/ Why change the part of me/ that has to be free, and while the song would appear to be about now each day/ is filled with the love/ that very same love/ that passed me by, it remains ambiguous whether the narrator has found love, or gotten over the idea of it: And here's the answer I found instead/ Found out it's in my head. “Break Away” is a different kind of song, perhaps not about finding or losing love, but about being freed from the hold and the sadness love can bring: a freedom song. There are of course many similar songs: breathing in the freedom of release from a dead or moribund relationship is a common theme. Songs such as the Kinks’ “Waterloo Sunset”, Peggy Lee’s “Is That All There Is”, Noel Coward’s “I Travel Alone”, and the Church classic “Under the Milky Way”, and many others, testify to a life after love, beyond it, and a relishing of the freedom of release from its bonds. As our small black car sped north through the sun and barren land, a red earth of sparse scrub and stunted gums, it seemed to me that rather than three kinds of love song, there are only two: that the boy meets girl and boy loses girl and boy gets girl back again are all one kind of song, of seeking and finding and getting and re-getting the union of love; while the other, albeit rarer kind of song, is about the obverse, of freedom from love’s union, or, as Coward put it, freedom “from love’s illusion”. Given that, are there only two, not three, kinds of love song: songs of attraction, and songs of release; songs of union and of disunion; of the security of the couple and the freedom of the one; of a community of two and the individual of one. It might have been the outback summer heat - it probably was the heat, which worked its way into the car despite the best efforts of the air conditioning at full throttle - but I could not help but associate further on this idea, and suspect that in love songs we are looking at a classic diametric opposition, or binary, of community/individual. Einstein came to mind then, his lifelong attempt to formulate a Unified Field Theory, to join together the sub-atomic forces of his E=MC2 with the gravitational forces that govern the behaviour of the cosmos, into a single grand Theory of Everything. String Theory purports to do so, though no-one seems in any way sure it actually does: that’s the nature of the beast, so it seems, when you are trying for the big one, the single god-like glance that takes in all. The conjecture came next to me that we are all walking Unified Field theories, carrying within our skins and cells and the folds of the brains that totter along atop our bones the very truths that the greatest minds have been seeking Out There. The source of this wild conjecture: the nature of the popular love song, with its diametrical opposites of love/beyond love, union/disunion, community/individual. The thesis: is not the popular love song also the grand universal force of magnetic attraction and repulsion, of coming together, and of spinning off on a lone trajectory, writ down in verse? And is it not entirely apposite that in the popular love song such immensities should be casually and quotidianly encoded, as they are the stories of the struggle - however facile we might often find the wording, and banal the tune - of our species to find love, and safety and comfort, and create a place between two people in which the species might reproduce itself and raise its young? Is not every love song in its own way part of the epic of finding love and making love and making a future generation; and is not the journey of love just as Odysseyan as the perilous travels of the sperm upriver to the waiting egg, or that of the child down the birth canal, a Stygian journey, and, when the child’s voice is ultimately heard, an Orphic triumph? Fairly wild conjecturing indeed, granted, entirely appropriate, I noted then and there in my driver’s seat, for an overheated head on a track of melting tar in a hot black car hurtling, so it felt, ever closer towards the sun. I had felt a bit odd all day anyway, it had to be admitted. Not so much after we began driving westward from the Country Comfort Motel in Hay, to an almost unseemly prosperous-looking Mildura, where we lunched under vines in a dandy bistro, but certainly from when we filled up at a forlorn roadhouse outside Wentworth. When I went inside to pay the woman behind the counter possessed the pathos of all human struggle in the rivulets of her face. She was about sixty, intelligent-looking but careworn, pushed out to the verge of the comfortable world by powerful forces, by destiny, fate. 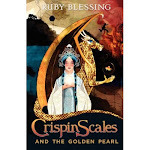 It wasn’t so much the lines in her face but that it seemed to be cracking apart in the heat, like a a Dutch master seen up close as little more than a yellowed shellack of a million tiny cracks. ‘Road up okay?’ I asked, taking a bottle of water from the chugging fridge. ‘Hotter today.’ I handed her my credit card. I signed the credit card chit, and an unseen little gadget printed a tax receipt. The slip of paper hung in the air an odd half-beat between her wrinkled fingers and mine. Our single human transaction was almost complete. ‘See you later,’ I said. ‘Yes,’ she agreed, though we wouldn’t. I went back outside and we drove on. For much of the trip Jack had been talking about a computer game that fascinates him, and that apparently fascinates many of the pre- and adolescent males of the developed world, called Grand Theft Auto. He had talked about it on many occasions, and knew it was not a subject that much interested me, but such was his evangelical zeal for me to share at least in a little of the spirit, that he had taken to telling me the story of each of its cast of criminal characters, and try to extract a soupcon of comic worth from them, if not morality of a sort. The story he told as we drove away from that roadhouse was of a character called Vic Vance, born into a poor black family, who joins the army to support the family. Despite his best intentions, he is wrongly accused of possessing drugs in the barracks - left in his locker by another soldier - and dishonourably discharged. Desperate to earn money and hot with vengeance against the man who ruined his military career, he becomes a gun for hire for criminal gangs, and in the course of the various stages and levels of the game, kills other gangsters in their multitudes. According to my son, who has finely calibrated sense of right and wrong, Vic’s past makes it okay for him to be a criminal himself: he had no choice. While replying that it is never okay to be a criminal - the stamped and approved parental response - I considered the parallel position of Michael in The Godfather film, who never wanted to join in his family’s criminal activities, but becomes drawn in nonetheless via the morally very defensible position of saving the life of his father from would-be killers. By the time that first chapter of The Godfather saga is complete, there is no prospect of Michael being able to return to any legitimate life. He shoots down in cold blood the men who plotted to murder his father, and ends up having his brother-in-law strangled for having beaten his wife - Michael’s sister - and for complicity in the machine-gun assassination of Michael’s brother Sonny. In all of these murky moral matters, I realised, there is a duality involved, another binary opposition, between what is desired - legitimacy, the doing of the right thing by human society and its laws - and illegitimacy, the doing of the right thing by one’s criminal family, however tarnished their own story, and illegal the acts required to be done. This gave cause for further reflection. Was I looking here at another case of union/disunion? That is, inclusion in a relationship, this time with society in general, on the part of Vic and of Michael, and disunion, where another calling, a loyalty to family, had led to them spurning that union for the disunion of criminality, the tainted wealth and phantom freedom of the outlaw, the hunted life in the shadow of the gun? It made me wonder about works of art, books, and whether the same principle applied, that at the centre of other human stories lay the same direct opposition of union/disunion? I scanned a mental gallery, the Mona Lisa, the Sistine Chapel Ceiling, Van Gogh’s starry night sky, Warhol’s soup cans and Elvis with his six-gun, Cindy Sherman’s movie-in-a-snapshot pix and the weirds of Diane Arbus, Damien Hirst’s cut-up cadavers... could I force everything, all art, shoe-horn it into my thesis - it had already madly become that - my own Incredible String Theory? Probably not. Just musings on the road. But curious, I thought, that this binary theory had come to me through digital music recorded to CD from my computer, another binary, this time the code, the very basis of how a computer works. And Jack’s binary of morality had come to him through a computer game - the binary code again. And of course we apprehend everything through the on-off switches of our synapses, our in-built binary system; as we are ourselves the definitive binary, with the On switch of life, the Off switch of death. We stopped at the one habitation on the Highway worth the word, at a place called Coombah, which might well be an indigenous word for “no shade anywhere”, and Jack nipped into the roadhouse for an ice cream. Two hours later we were at our destination, the Silver City of Broken Hill, unique and beautiful to my eyes, of solid stone structures built by mineral wealth, of the great history of the labor struggle and the tradition of the miners, of the Social Democratic Club; of a massive plateau of slag like an altar to profit, and at its base the crosshatching of pretty tree-lined streets of miners cottages, and running away in all directions a desert of such ruddy pink beauty that it has drawn unto itself its own sect of painters, the Brushmen of the Bush. As Jack splashed in the motel pool in the evening and the hotted up cars of the hoons raced up and back down an endless Argent Street, I sat on a plastic chair thinking I love my son, but I do not live with him: destiny. It was destiny too, my own song’s next verse, that I should have been fortunate enough to find new love, and father a new child. Perhaps then the only real binary of love is chance: the bad luck, and the good; or is it taking your good luck, as well as your bad?